When I have the chance to quilt for myself, it tends to be about skill acquisition. 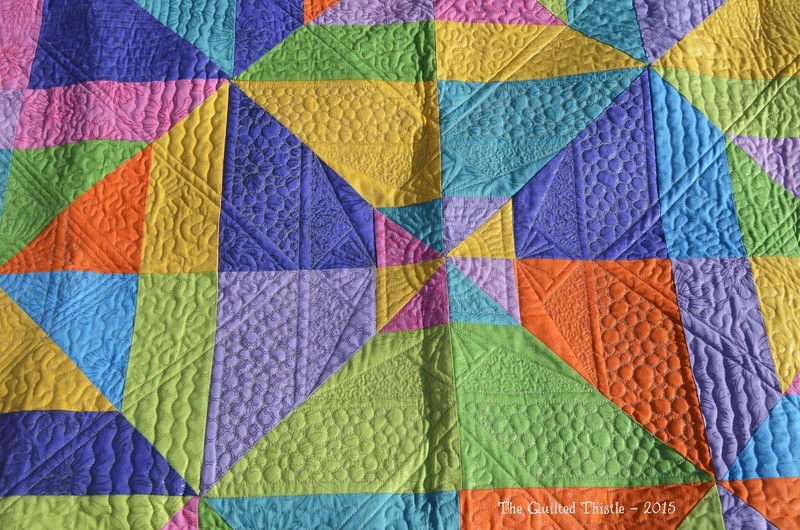 I spend a lot of time thinking about different quilting patterns, but not all of them quilt out the way I envision them. 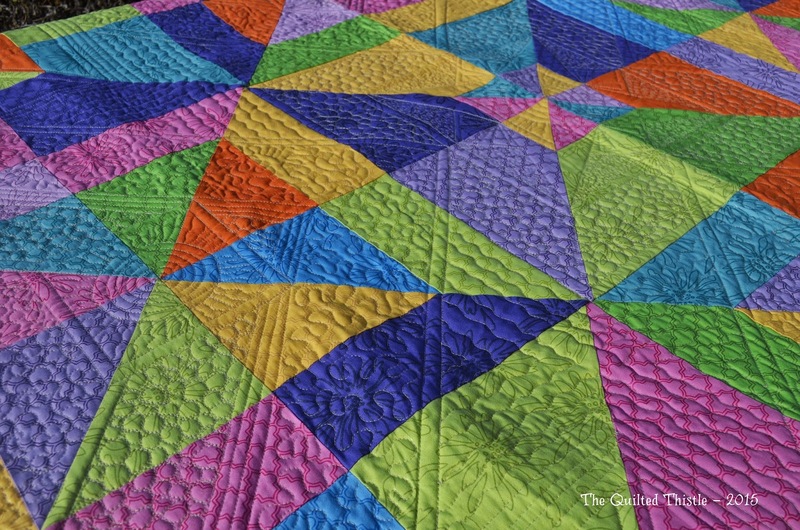 When I pieced “Whirlygig,” I was determined to create a secondary quilting pattern to explore. 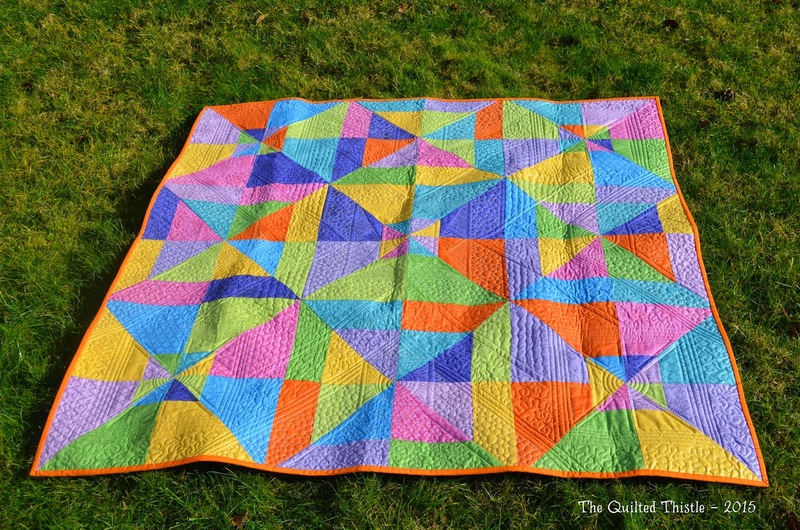 I had a colorful layer cake and wanted to keep the piecing simple since I’m such a quilting newbie. I started with one idea in mind, and after I had cut all the layer cake up – I changed my mind. After all, it’s my prerogative, right? 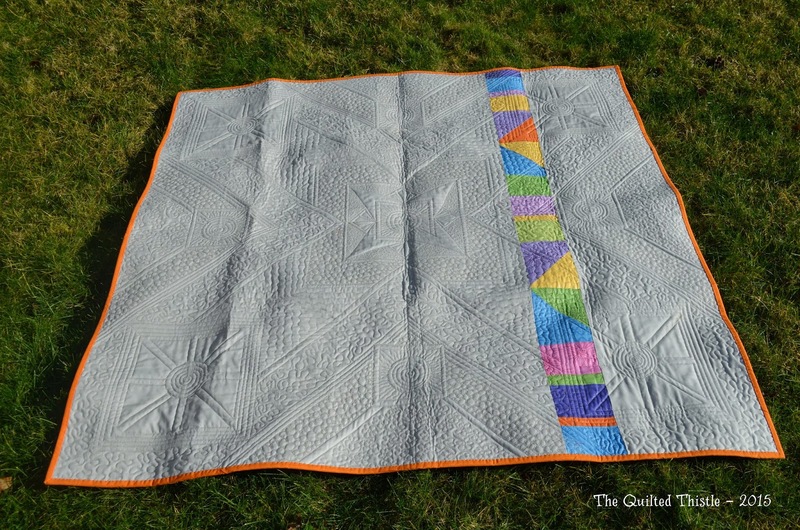 If you look closely at the finished quilt and the original plan, you’ll see I changed it up a tiny bit once it was loaded on the frame and I was stitching it all together. I shouldn’t tell you this, but I forgot one design element I was planning on using once I got the machine going – so it got edited out. It was just an idea, after all – and I was fine with it changing during the process. 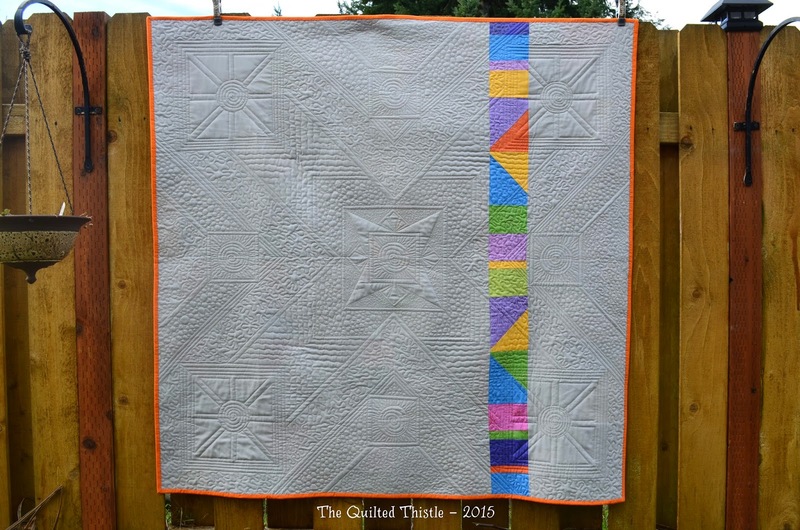 Working on this quilt soon became all about marking and ruler work. Having a master plan to refer to was really helpful when working on individual sections of the quilt. 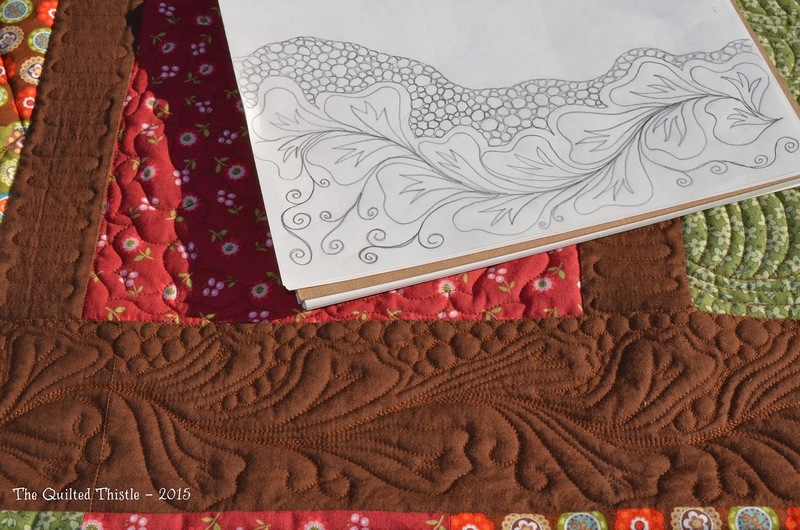 I chose the fill motifs as I went along – The photo above shows the last and probably most difficult decision I made while quilting this. I just had no idea for a while as to how to fill this hourglass shape. Since a friend had commented on liking a particular pattern on a previous quilt, I decided to try it out and it ended up giving a nice texture to the piece. 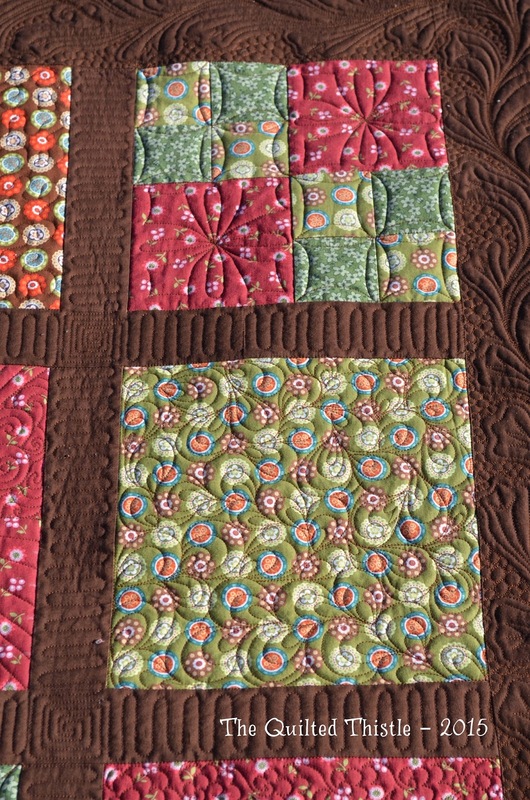 Needing a unifying design element, I chose these spirals to go in the center of each of the pinwheels – regardless of whether they were small or large. My second unifying theme was using secondary patterning to reverse the visual details on the large and small pinwheels. 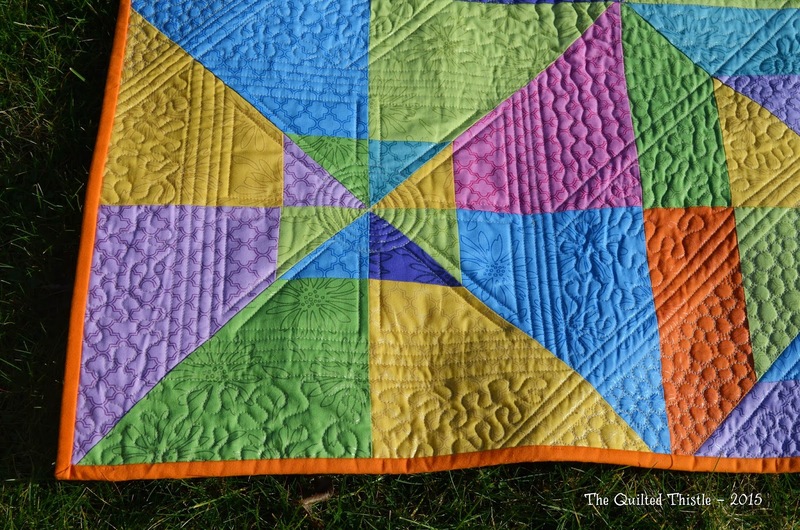 For example, if it was a small pinwheel, I quilted it as if it was a large pinwheel. 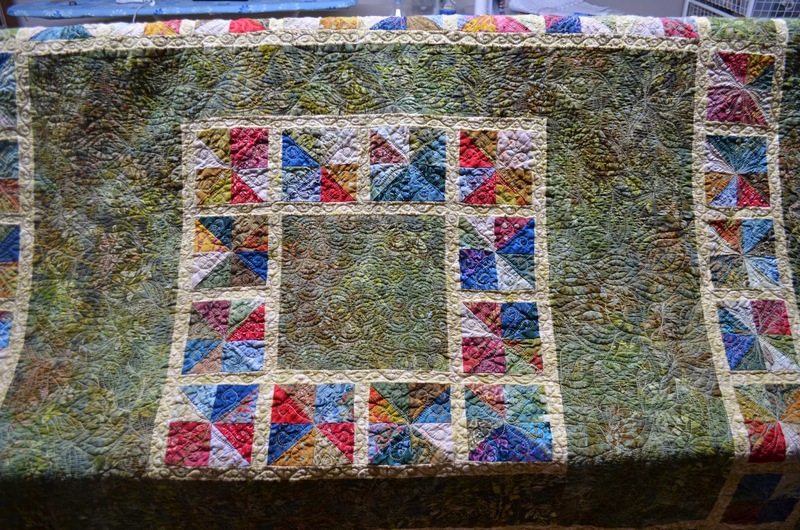 I also treated the center block as a sort of medallion and gave the quilting a focal motif that was different from the surrounding blocks. This also gave me an opportunity to practice my micro-stippling! If I were doing it all again, I would have used more variety in the filler size. Sometimes the secondary patterning isn’t as visible as I intended. But once you turn it over and get a look at the back, you can see it way more clearly! Actually, I liked the way the back turned out so much that I’m contemplating designing my first whole cloth quilt. It’s amazing how one idea so quickly leads to another. This is my tenth quilt. 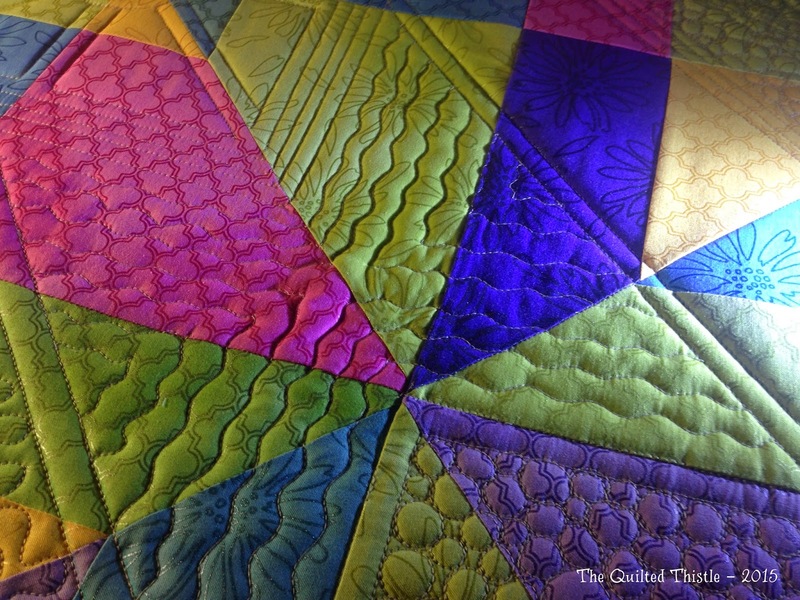 When I decided to buy a longarm quilting machine, I knew that it was going to take a LOT of practice. 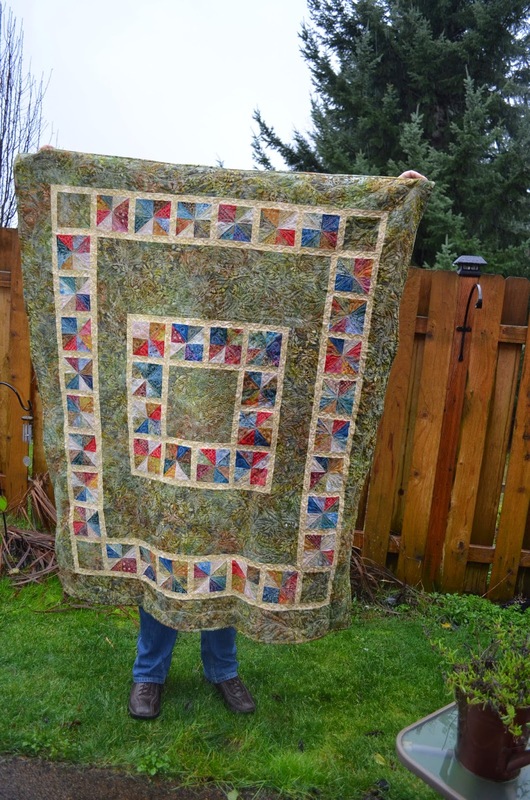 I also knew that I wanted to have a lap size quilt for my family that would be a sampler and showcase some new techniques for me to try. When I decided to get back into sewing, I started buying fabrics for my “stash.” These fabrics were good quality quilting cottons that I purchased quarter yards of. When I decided I wanted to piece a simple top for practicing, I chose four prints and a solid. 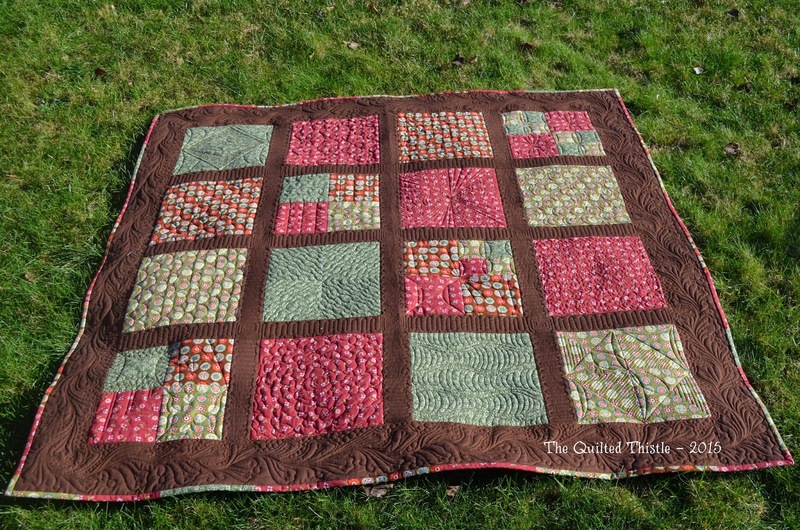 Once I had the top pieced, I started thinking about how to quilt it. I wanted this to be a quick and easy project in between some larger ones – so I wasn’t really wanting to do a lot of marking and pre-planning. I had recently made a doodle in my sketch book while dreaming up possible quilting motifs. I thought this border turned out well for a first attempt. I’m sure I’ll explore this more on future quilts. It was a lot of fun! I was able to try out some continuous curves on the small blocks, and some paisley filler. Some geometric ruler work combined with some free motion filler. I liked the simplicity of the scrolls and the multi-directional arrow motif. 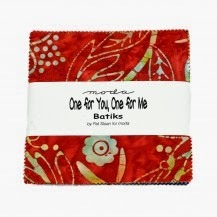 I found some designs that I really liked, and want to include in future quilts. And I decided to really have fun with the backing fabric on this one. 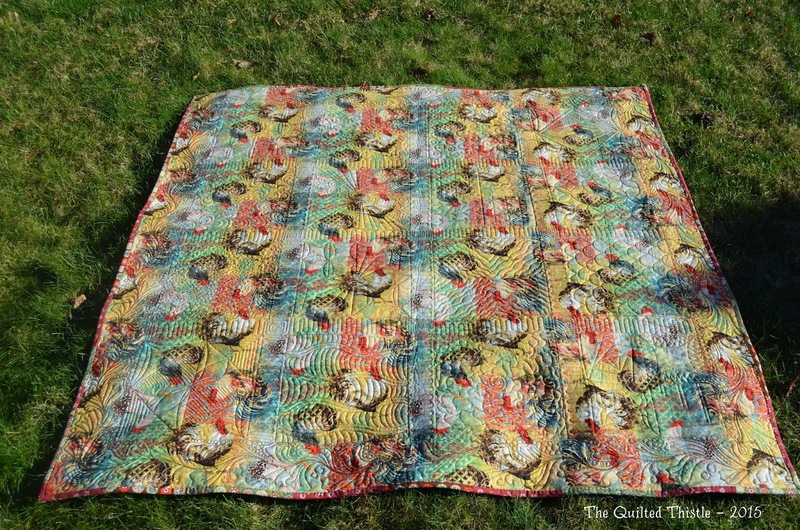 I fell in love with this rooster print, and knew right away it was the right one for this quilt. I used Hobbs 80/20 batting, which has more loft than Warm and White Cotton, and will be a bit warmer in the winter months. 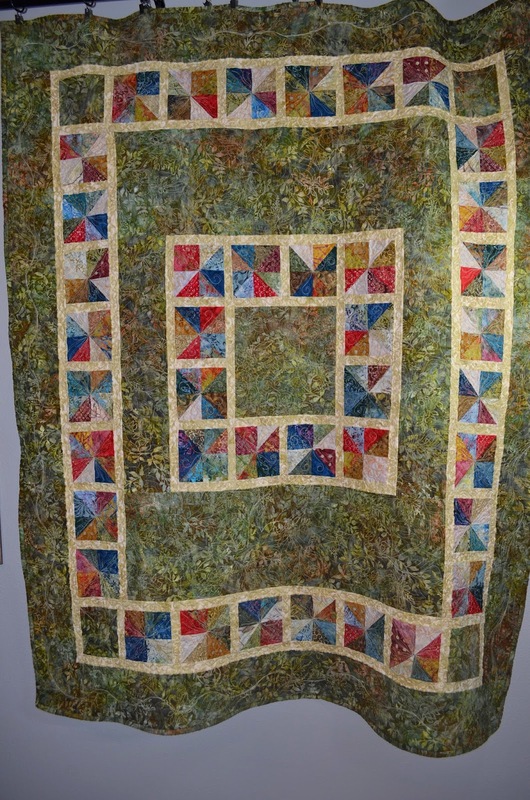 After all, this quilt is all about snuggling up on the couch. I’m excited to see how it looks after it’s first trip through the washer and dryer. This quilt took a while to be finished. In fact, at one point in time, I wasn’t sure it was EVER going to get finished. 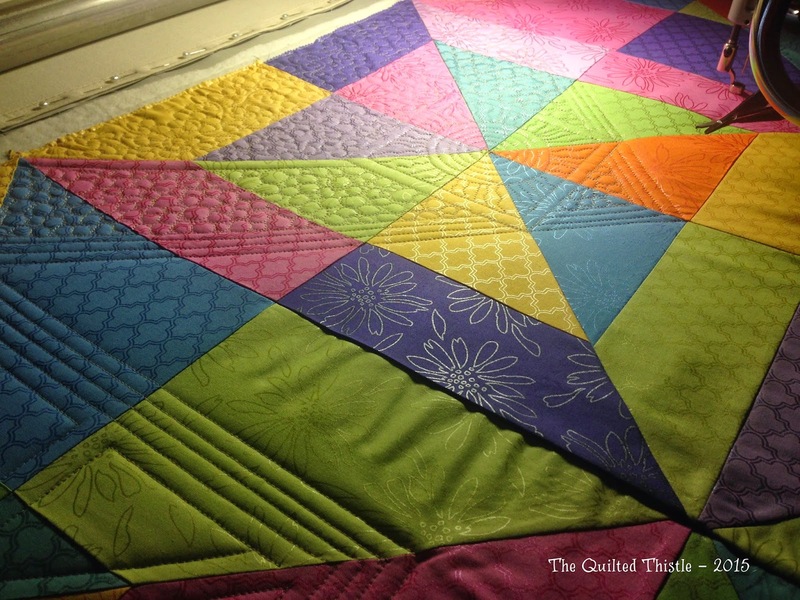 When I decided last year that I was going to pick quilting back up, I never anticipated how that simple decision would turn into The Quilted Thistle. 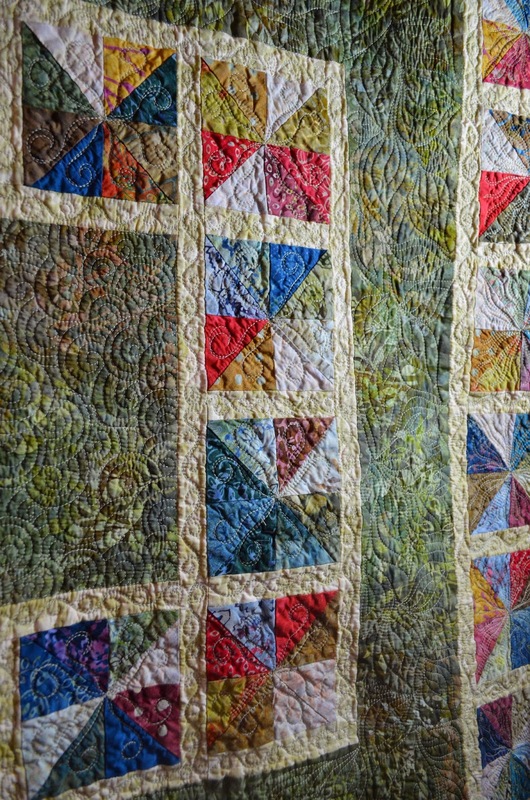 I just knew that I grew up watching my grandmother and great-grandmother take scraps of fabric and turn them into precious quilts – and I wanted to follow in their footsteps. After all, no one else in the family quilted, so it felt like a good way to carry on traditions and take my sewing hobby back up. So, with that idea in mind, I went to Fabric Depot and quickly lost myself in the possibilities. After walking around with starry eyes petting all of the beautiful cottons, I just wasn’t sure which ones to choose for my first project. In fact, I was suddenly really overwhelmed with all the possibilities. Where to start? Clearly, I needed a different tactic than just randomly walking around the seemingly endless bolts of beauty. So, I took a moment to collect myself and redirect my efforts. 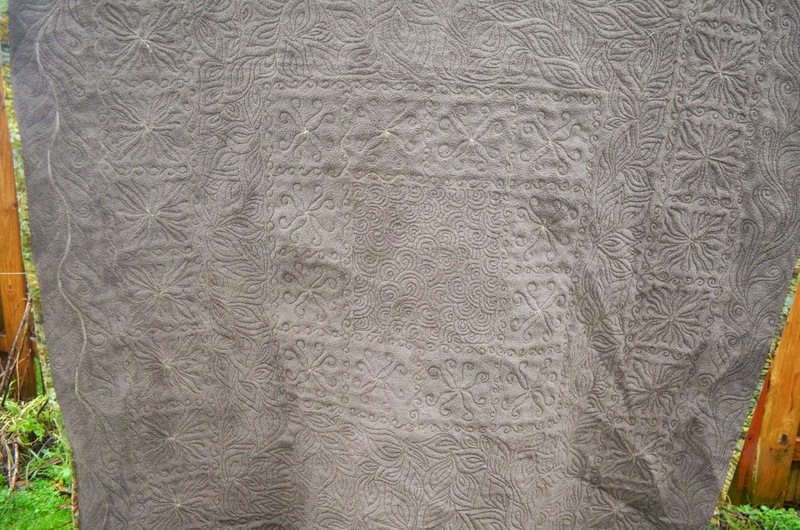 I had been doing a lot of quilting research via Pinterest, and was curious about pre-cut fabrics and what it would be like to make a quilt out of them. 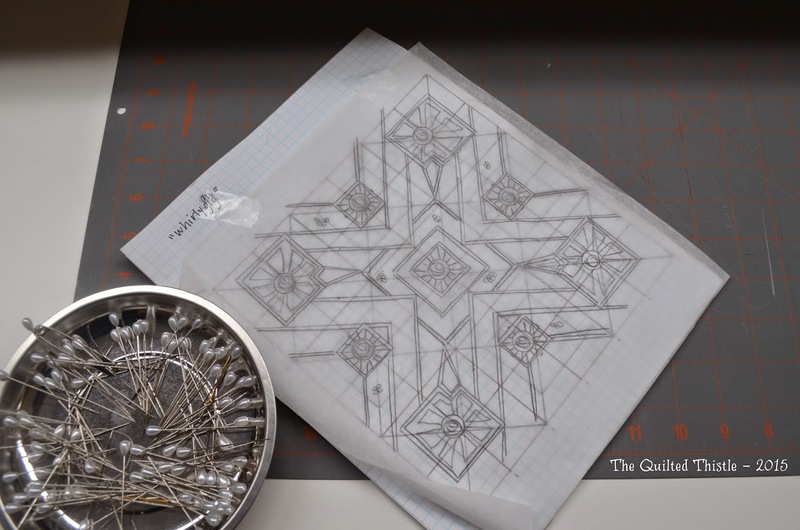 That’s about as far as I had taken the idea – but when I found myself in a fabric store unsure of what to do, I remember grabbing onto the idea of precuts and taking myself over to the precut section to check out what was in stock. Now is probably a good time to admit that I tend towards the “not sure what this is going to end up looking like, but I’m going to have fun figuring it out” process when it comes to art. 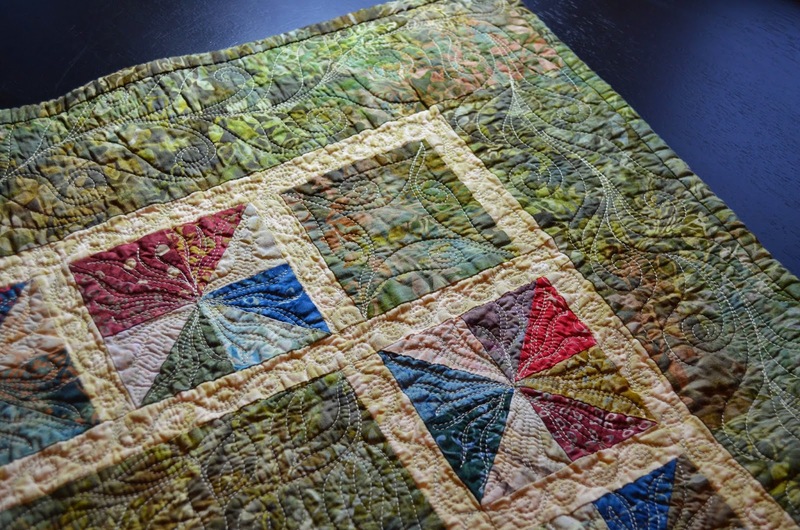 I’ve since discovered the term “Improvisational Quilting” – but at the time, I was absolutely unsure what to do with these little 5″ squares of batik fabric. I’m sure at least a couple of weeks went by while I was “researching” ideas. Eventually, just like when I found myself in the fabric store – I decided I just needed to get started and see what would happen. So I started making pinwheels. 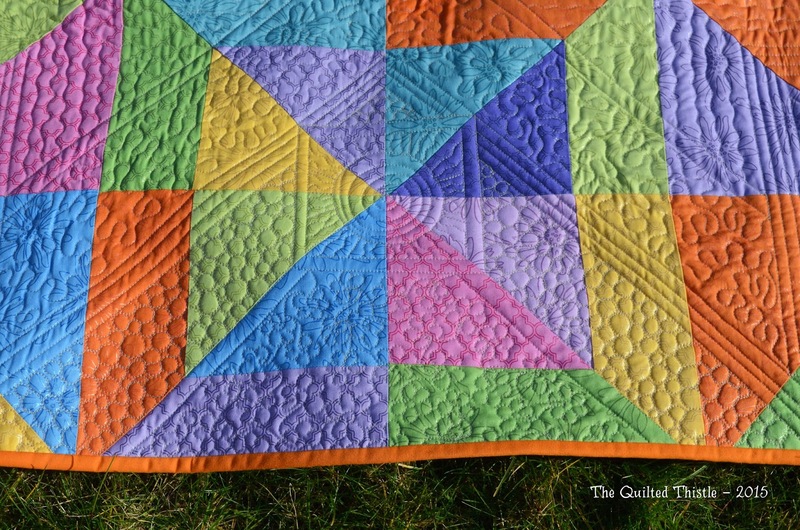 It’s not a perfect quilt. 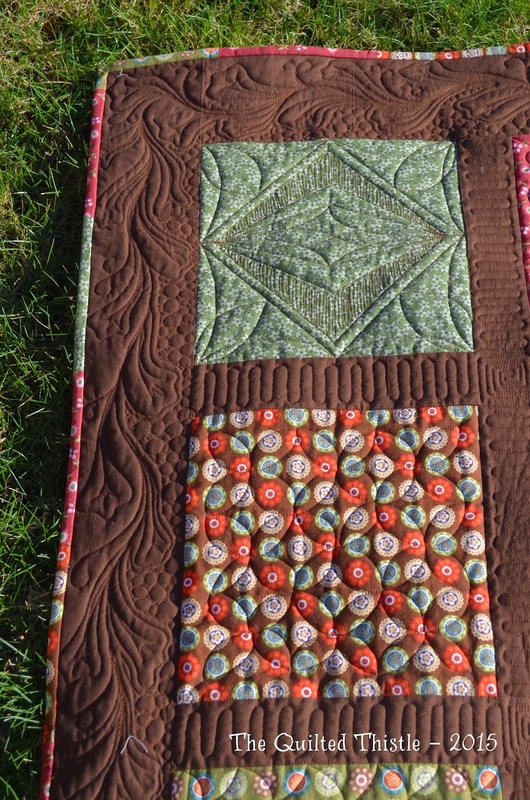 Since it was my first, I didn’t know anything about the correct way to add borders or how to keep a quilt square. My pinwheels aren’t all perfectly pieced – but I learned how trimming them up can fix a lot of issues. I also ended up with wavy borders that I had read plenty about – and now understand why people recommend taking them apart and redoing them before loading on the longarm. 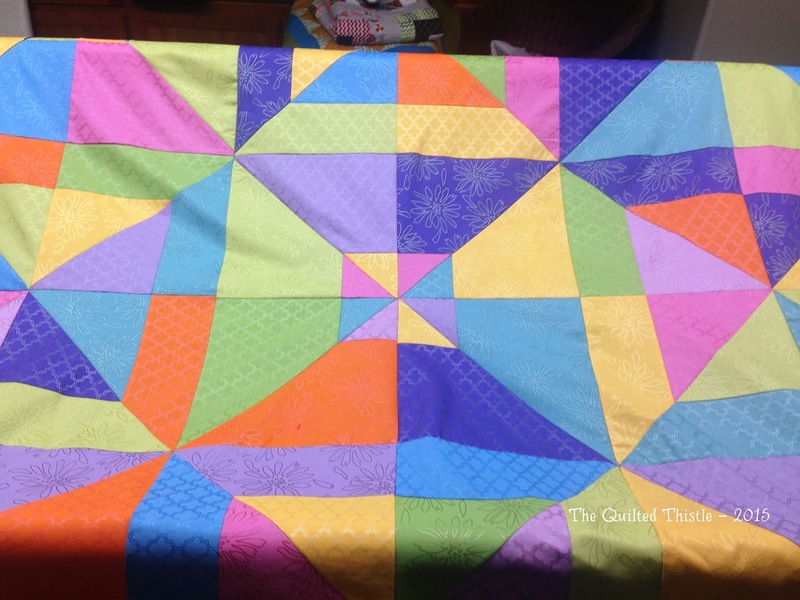 I didn’t – so I had to figure out how to densely quilt and make tucks in places that wouldn’t be as noticeable. 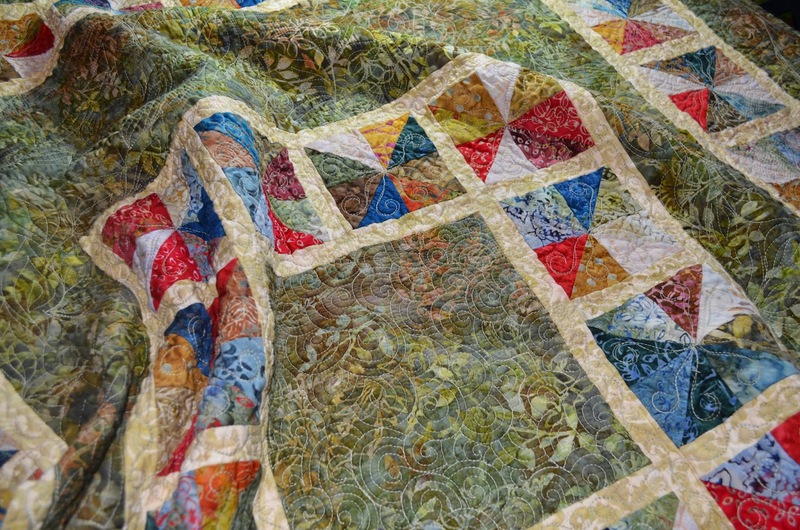 I also fell in love with the crinkled texture that comes after the finished quilt is washed for the first time. It’s soooo wonderful to touch and keeps you super warm! Although now that it’s done, I now think that it is absolutely perfect, just the way it is! I’ve seen several different ways that parents-to-be have revealed the gender of their baby. 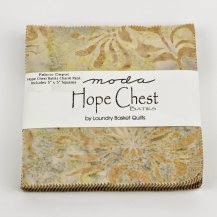 When I was contacted about quilting some baby quilts for this purpose, I was really excited at the opportunity. 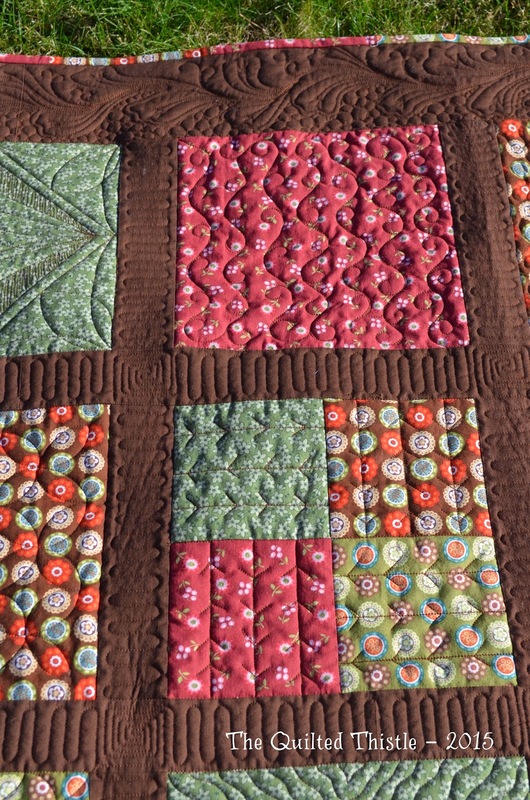 These small quilts started as two panels – one for a boy, and one for a girl. Both were designed to be made into soft books, but I love the way they were turned into quilt tops! I don’t know about you, but I’m sure curious to know which gender was revealed when the parents-to-be opened their baby quilt gift on Christmas morning!